I've never quite understood the point of a "fruit soup": isn't it the same as drinking a smoothie? I thought. This recipe proved me wrong. Mango gazpacho is the definition of refreshing. I couldn't get enough of this, so I'm glad I made the whole recipe, enough for 6 servings. I had it for breakfast, dessert, even a simple snack. And it's not at all like drinking a smoothie, or even smoothie-like. 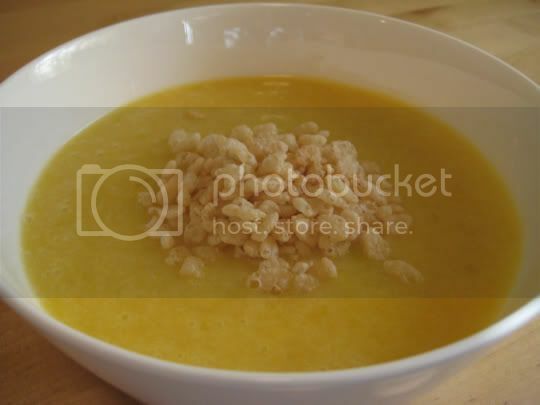 It is pureed only enough to retain some of the chunky mango texture, and most of the minced fresh ginger remains in pieces, adding a nice crunch and burst of flavor (for those who don't like the spiciness and strength of fresh ginger, this recipe probably isn't for you). So now I understand the point of a fruit soup, even a palate cleanser. This was wonderful, cool, and light after eating a hearty meal, when you are just a bit too full for a rich dessert (what, too full for dessert?...). Make again? Definitely, and the recipe is great as is. I sampled this last night and I was like DANGGGGGGGGGGG that is good. I mentally prepared to drink it all for breakfast the next morning. The next morning, excited with anticipation of what I had experienced the night before, I took a sip to realize, ewwwwwwww. Shosho you are correct about "for those who don't like the spiciness and stength of fresh ginger..." because I could taste it way more in the morning, then I had the previous night. I did not like. The night before there was a hint of ginger with more mango. I found it to be opposite when I tried it the next morning. Ginger isn't a bad thing, but I just do not like it that much especially, when I had mango taste on the brain. I'd have again right when it is made before the ginger settles. Maybe a simple re-blend or shake would have made it ok.